If you are dissatisfied with your order for any reason, please call our toll free number 800-421-4287, to discuss as soon as possible after you have received your order. Or e-mail us at, texashatters@sbcglobal.net, if you are outside of our toll-free range of service. We will do everything we can to correct any problem or concern you may have about your order. Our preference is to repair, exchange or re-make, with returns as a last resort. When no other option is accepted by the customer, please understand that shipping and handling are non-refundable. We also cannot re-use the printed leather sweatband, which must be discarded, and must deduct the cost of it from your refund. If an order is canceled prior to shipping and prior to the printing of the sweatband, a full refund will be given. Returns will not be accepted if the item shows evidence that it has been worn for longer than to try it on, i.e. ; sweat or make-up on he sweatband or stains. In the case of non-wearable items, a returns will not be accepted unless we are made aware of the customer's desire to return it, prior to the return of the item(s). As stated above, we would rather work out the problem if we can. 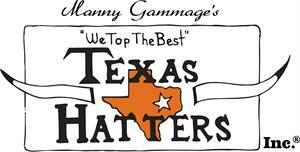 Thank you for doing business with Texas Hatters.